This whole-page illuminations shows two knights sitting on a bench covered with a carpet with red and green stripes whereas two others are sitting on another bench covered with a cloth patterned with black and white lozenges. On the floor thereâs a carpet with zig-zag pattern. The players are sitting under arcades with pointed arches, the roof showing alternating cupolas and turrets with tiled roofs. The walls are ornamented with slits and trefoils. All the players wear capes in different, contrasting colours. They are sitting around round-shaped Backgammon board, furnished with a handle from which is hanging a bag, presumably to hold the tables-men after use. Every players is handling, or reaching for a small white chip (?). Next to each players is a ãrollä of pieces waiting to be entered. They show the colours white, black, red and green. Each players has aleady entered 3 men and is holding one more in the hand. These four players are playing a four-headed variant of Backgammon called el mundo (the World), or more exact el tablero delas tablas delos quatros tienpos del anno, a que dizen el mundo (the board-game with tables-men of the four seasons of the year, which is called ãthe Worldä). This game then is the tables-equivalent to the ãchess of the four seasonsä which is described on the preceding pages. Derived from this chess-variant are the number of players (four) and the colour of the men, corresponding to the four seasons: spring - green, summer - red, autum - black, winter - white. As in the chess-equivalent, el mundo is said to represent the successive reign of the seasons during the year. The games is played with three dice. 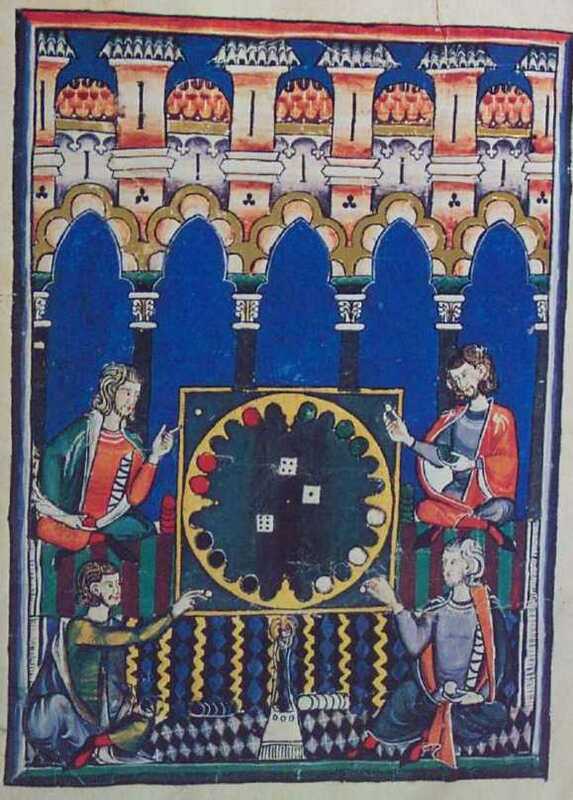 The stage depicted in the illumination is that of each player having thrown once and each having entered three men. One of the players has now thrown 1, 4, 6 - presumably Autum (black) which would enable him to fill his whole table with men. Each players has to enter his 12 men in his table before he can move on. Play is anti-clockwise. The goal is to get your men to the opposite table and bear them off there. Captured men have to be reentered in the starting table. This illumiation is also shown in Sanchez Perez (1944) and Steiger (1941), p. 360, both black-and-white.